- Do have complex scanned meshes to Reverse Engineer? - Do have ZBrush sculpted meshes to bring to a CAD System? - Do you need powerful tools to deal with real world meshes? - Do you need to capture fine details in the mesh? - Do want an easy to use way to create high quality CAD data? 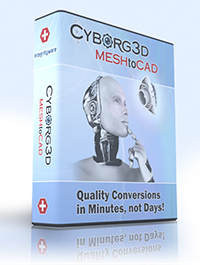 Cyborg3D MeshToCAD standalone product is tool for you! It is aggresively priced compared to other industry solutions and captures very fine details on the scanned/sculpted mesh. The work flow is highly automated and high quality meshes can often be processed in a matter of a few minutes. Scanned meshes are notorious for being difficult to use. But Cyborg3D has a unique set of tools to allow you to quickly repair meshes and even fill in missing areas of the mesh. We believe you will find our workflow for problem meshes is extremely efficient compared to other industry solutions. Our tools allow precise control of accuracy and surface breakdown. The resulting NURBS based boundary representations are very high quality (G2 along the edges) and can be exported to the standard CAD file formats(STEP, IGES, and SAT). Our optimized lightweight representation facilitates the ability to import and process even large, very complex geometry with extremely fine levels of detail.